You hear a lot of things when you start out as a writer. One of the things I’ve run across is you shouldn’t write in different genres with the same pen name. Well I said phooey on that when I came up with the idea of my Stories from Bennett Bay. I envisioned a collection of stories bound not by genre but by setting and the people living there. I thought even people in the midst of paranormal fantasy drama still have some kind of mundane existence. They still have to go to the market. They go out and visit friends; they rub up against all kinds of folk. And I truly believe everyone has a story. I wanted to tell those interwoven stories. I’ve laid a lot of the ground work with my short stories and the Live Oak Tales. Return to Cooter Crossing was the book I got to weave all the parts together. It’s a standalone story, but I’ve woven in the characters from many of my other stories. The hope was to add a layer of subtext that rewarded the folks who’d read my other works. So far, it seems to be working. 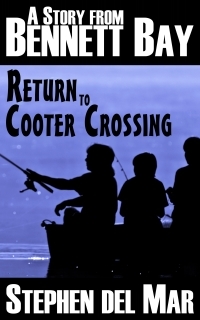 Return to Cooter Crossing isn’t a paranormal swamp fantasy. It’s a contemporary family drama with a bit of romance in the mix and the fans of the Live Oak Tales haven’t batted an eye. It’s almost like readers like reading more than one kind of story and are smart enough to understand that one storyteller can spin many different kinds of tales. I’m learning that a lot of advice out there for writers is a bunch of gator pooh. Now to the actual topic of this post! Dan over on the Love Bytes review site wrote an excellent review of Return to Cooter Crossing and gave me five stars! His comments lead to my ramblings above. It’s exciting to get feedback that affirms your intentions. By the way, I recommend the website if you’re an author. They are very professional. They always let me know if they will review a book or not, in a timely manner. I understand that review sites get swamped with request, but I only think it is courteous and professional to let an author know if they are interested. I hate submitting books and never hearing back. A “no thank you” or “we’re not interested” is just fine. Silence is not. Thanks for stopping by the blog and remember if you sign-up for my newsletter you can get a free copy of one of my ebooks.